A very sleek and modern looks makes this Silver javelin style custom pen a must have giveaway at any event. This promotional pen features hot neon colors with rubber grip echoing chrome band design. A click-action logo pen that is comfortable to write with and features large imprint areas and vibrant colors. A click-action promotional pen with a distinctive streamlined shape. 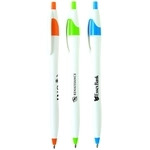 Make a splash with this logo pen that features exciting trim colors upon a bright white barrel. A lightweight aluminum ballpoint promotional pen with click-action mechanism and inlaid teardrop soft grip. This everyday modern Executive Twist Promotional Pen stands out in a sea of promotional pens. Its unique shape is eye-catching, and it comes in 4 great colors. This Vienna Aluminum Click Promotional Pen w/ Comfort Grip features a rubberized finish for extra comfort no matter where you grip the pen. Your engraved silver logo will stand out above and beyond other imprinted pens! Your company logo will rise time and again on this ergonomic and colorful click custom pen. A very sleek and modern looks makes this metallic javelin style custom pen a must have giveaway at any event. This Metallic LED Executive Custom Pen converts to a bright and powerful LED light by double clicking! This multi-function pen provides a high-end look and comes in 4 bold colors. A very sleek and modern looks makes this javelin style custom pen a must have giveaway at any event. A sleek executive quality promotional pen with a high-end look but without the high-end price. A very sleek and modern looks makes this javelin style dart custom pen a must have giveaway at any event. This shimmering Metallic Click Custom Pen w/ Rubber Grip has chrome accents for a bold look. It's ergonomically contoured shape and comfort grip will make this pen your clients go-to writing utensil. A promotional pen with four brushed metallic colors for an executive look. MaxGlide custom imprinted stick pen features a newly formulated hybrid ink that provides a gel experience with the consistency of a ballpoint! This promotional pen has a classic design and is a definite eye-catcher. This stylish Metal Twist Promotional Stylus Pen is available in 5 stylish colors! It features a stylus tip to help keep touchscreens free of fingerprints. This makes a great promo item for universities, hotels and even at restaurants. Looking for a fun back-to-school or new hire giveaway? This Iridescent Metal Twist Promotional Pen will stand out with your logo imprinted on its rainbow iridescent finish. Have your logo or message imprinted now on this colorful pen! An impressive metallic color promotional pen set off by sculpted chrome accents and solid black grip. This elegant Vinyl Wrapped Rollerball Style Custom Pen has a high end look. Made of brass and wrapped in vinyl, this stylish pen makes the perfect gift for employees or clients alike! Add some color to yor campaign! This Mardi Gras Promotional Pen comes in a variety of festive colors with distinctive silver accents.